Decorating update and new project! We’ve painted a couple of rooms, and after about a week with no window-coverings I started thinking about what to put up in our kitchen/dining area. We’re renting, and the blinds that were in the windows when we moved in are rattan, which is fine, but I just wasn’t feeling it. I contemplated making curtains, but I couldn’t decide on a fabric. Well, the other day, while at one of my favorite thrift stores, Thriftland, I ran across a sheet set that I thought would be great. $7 later the sheets were home with me, where I determined there was just not enough fabric for curtains for all of my windows. 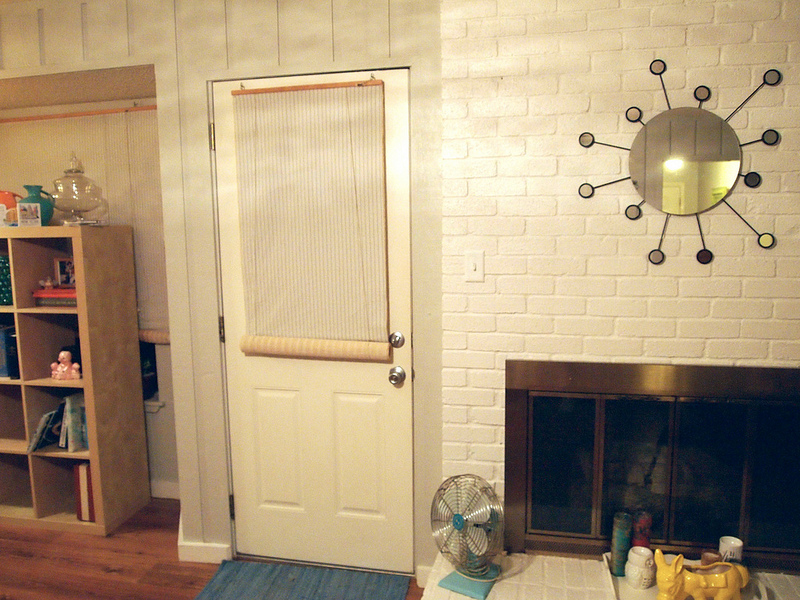 No worries – Plan B came to me – I decided to use the fabric to cover one side of the rattan shades. The process was a little trial and error. I figured initially that it would be a breeze to stitch the fabric onto the shades. 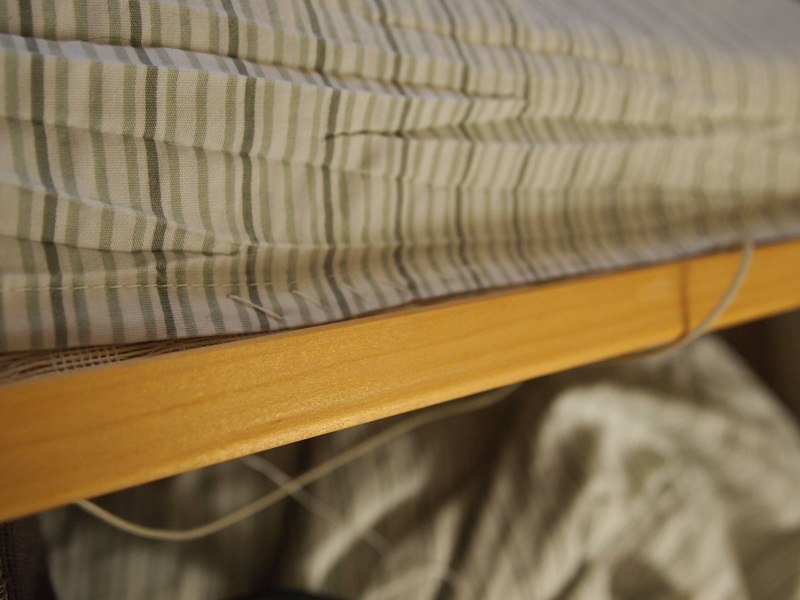 The flat sheet was almost the exact size of my largest sheet – a little long, but I figured I could just turn under the cut edge a couple of times at the bottom and no one would be the wiser, as the bottom is usually rolled up, at least a little. The stitching was definitely not a breeze. 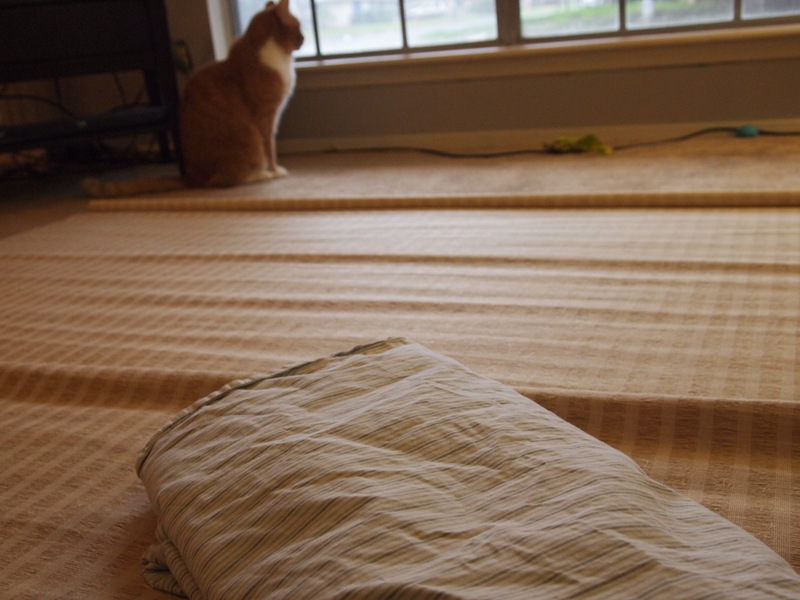 To get the edge of the sheet as close as possible to the top of the blind was a task. And though the needle slid right through the woven blinds, once I got close to the ends my stitches started slipping right off the horizontal slats, which had no vertical weave on the ends. The other issue I ran across, which is perpetual for me, is that I was lazy when I started this. I laundered the sheets, but I didn’t iron them. You know how sheets will get kind of wrinkly on the edges? Well, those wrinkles made it a lot harder to eyeball the placement and stitch the sheet straight. After I finished the top edge I realized I had several extra inches of fabric on one side of the blind, and a slight slant to the pattern. I found myself bouncing back and forth – stitching a foot or so on one side of the blind, then a foot or so on the other side, to make things as even as possible. In the end, I had one side of the blinds with the hem of the sheet exactly on the edge of the blinds, and the other side has fabric wrapped around the edge. The good news is, that particular blind is over a window that is BEHIND my bookcase, so even though you see that it’s there, it’s pretty well hidden and my goofs aren’t too noticeable. Also, I learned from that mistake, and after smacking myself in the head I got out my glue gun to finish the smaller blinds. Not only did it go faster, but as the glue will peel off if I need it to, I was able to reposition when I had my alignment off. Though my method was definitely flawed (I’m sure someone out there has done/will do a much better job) the end result works well, I think. The foundation of this room is pale gray and white, so I think the blinds work nicely. 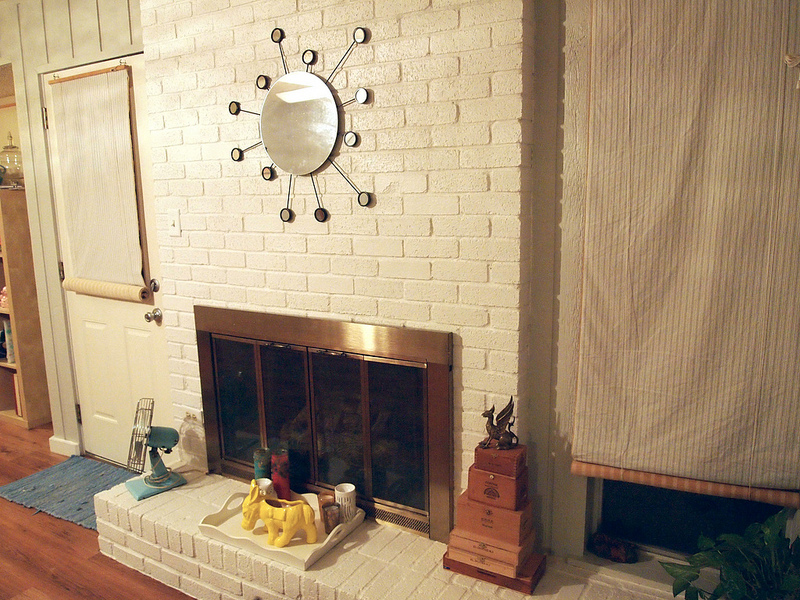 (We painted the fireplace – doesn’t it look great! So happy our landlords were OK with that!) Don’t worry – I’ll be adding in plenty of color on down the line! Well, it’s official, we are moved into our new home! Whew! I have to admit, I hate moving. It’s all stressful and icky. I much prefer being settled, and I’m so looking forward to the process of settling in here! I plan to share the home-making process here with my four or five regular readers – you lucky people, you. Here are a few photos of our new place, the day before we moved. We’ve got a few boxes and tools stacked on the fireplace, and there are still a couple of things from the previous tenants lingering, but you should be able to get an idea from these. 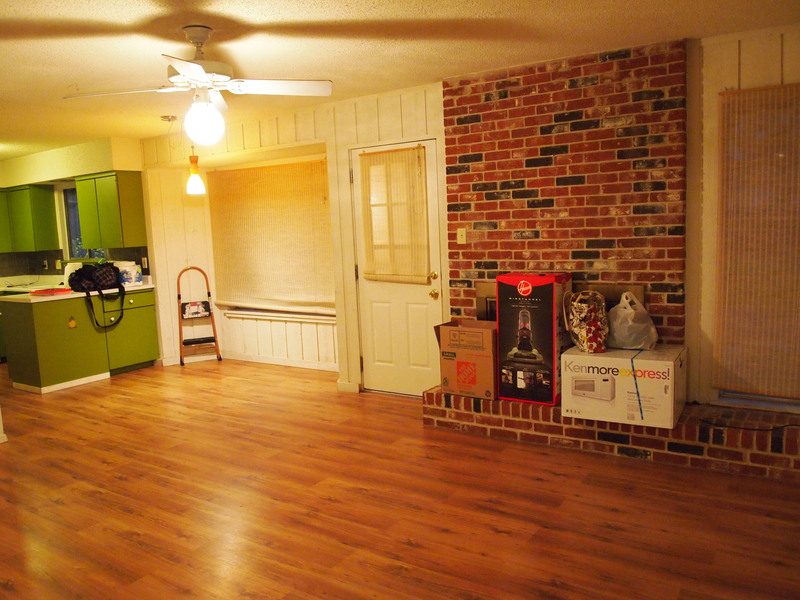 The first room we are tackling is this long kitchen/dining/living space. 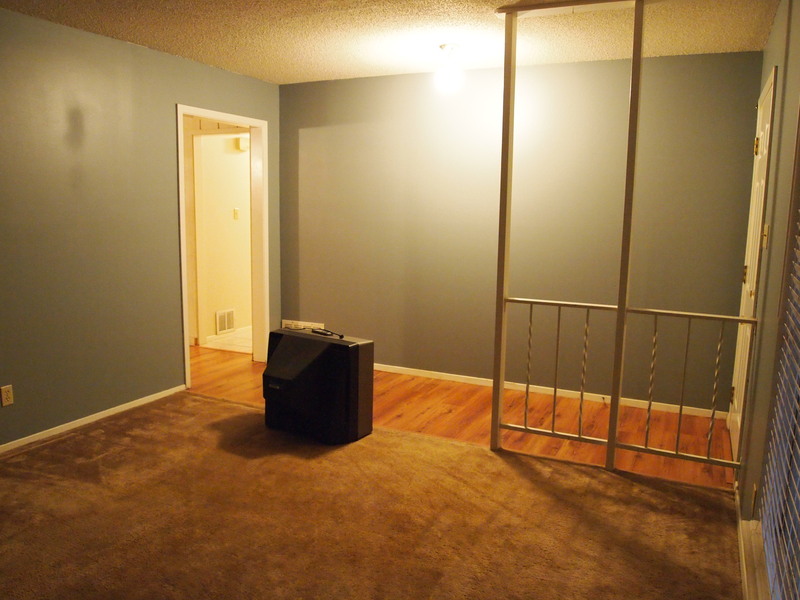 We won’t actually be using it as living room, despite the fireplace. My fantastic, bargain-hunting hubby found a great deal on a slightly dinged up dining table that just happens to be HUGE, so it will go across from the fireplace. I also hope to find a good place for a little office space in here. The living room will get a coat of paint, and we just ordered two new couches, so once they arrive I will finish it with art and accessories. 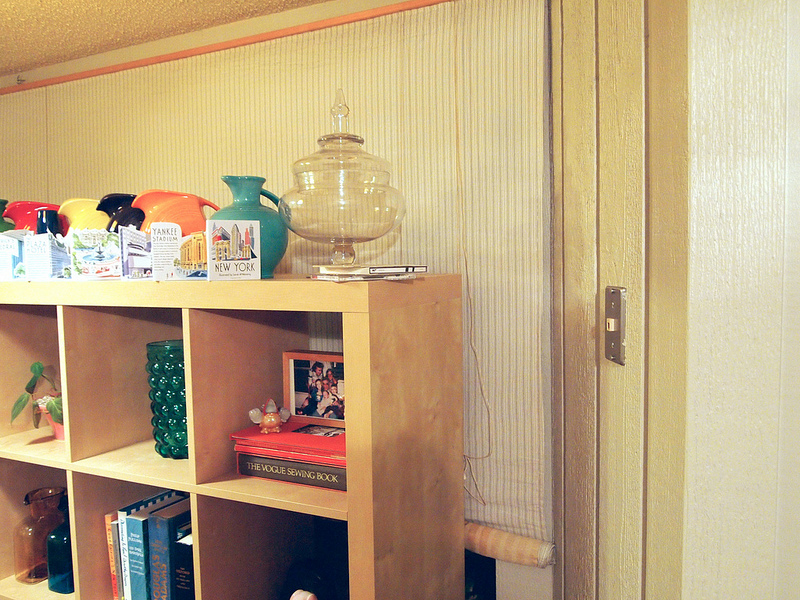 I do need to decide what to do with the old-school 70s divider by the front door, as we can’t take it out. It’s so exciting to have this blank slate to work with! After moving our stuff in we brought the kitties from our between-homes crash-pad. We hooked up the television, hit the Redbox, and took a break from painting and unpacking to chill out for a while. Things may not be settled yet, but it still felt like home! 2012 is going to be a great year! I have a lot of plans, and tons of fun things to share with you. But for now, I’m completely buried! We’re moving twice in the next few weeks – first to storage, and to a vacation home for a temporary stay, then again in the beginning of February to our new home, after it has a nice, fresh coat of paint. In addition to moving we have not one, not two, but THREE important birthdays coming up for family members aged 8 to 61! It’s also time for Eckman’s Card, Comic and Toy Show, and as usual the hubby will be setting up a booth there, and I’ll be on hand to help. This time we’re planning quite the button-making set-up, so if you’re in San Antonio stop by and make yourself a custom button! With all that said, I’m going to be swamped for a few weeks, and posting here will be light to non-existent. But once I’m back I’ll have all manner of exciting things to share, from recipes to decorating, craft projects to theme parties. In the meantime go visit some other fun sites! I’ll get you started. Beautiful recipes – makes me wish I could draw! Test your movie knowledge – found on How About Orange, who always has the best time wasters! And finally, a really bad video (MUST HOLD THE PHONE HORIZONTALLY!) of one of my sweet kitties exploring the top of the empty closet. Right before I took this he was talking up a storm, but as soon as the camera came out he decided to just roll around and look cute. I know the quality is horrible on the video and the picture at the top, but I have a new toy on the way to fix that soon! Like I said, 2012 is going to be great! I have a love/hate relationship with robes, especially in the winter. I want to be warm when I get out of the shower, but I hate battling swaths of terrycloth. I want something a little girly, but satiny, silky fabrics are worse than useless in my opinion (see “warm”). I decided a lightweight flannel robe would be great, but being very particular and knowing exactly what I wanted, I couldn’t find it anywhere (at least, not with a price tag I was comfortable with). Technically I know how to sew, and I could go buy some flannel and a pattern, cut it out, stitch it up and hope for the best. But honestly, especially after the making extravaganza that was Christmas, I’ve been feeling lazy. Luckily I came upon the perfect solution. 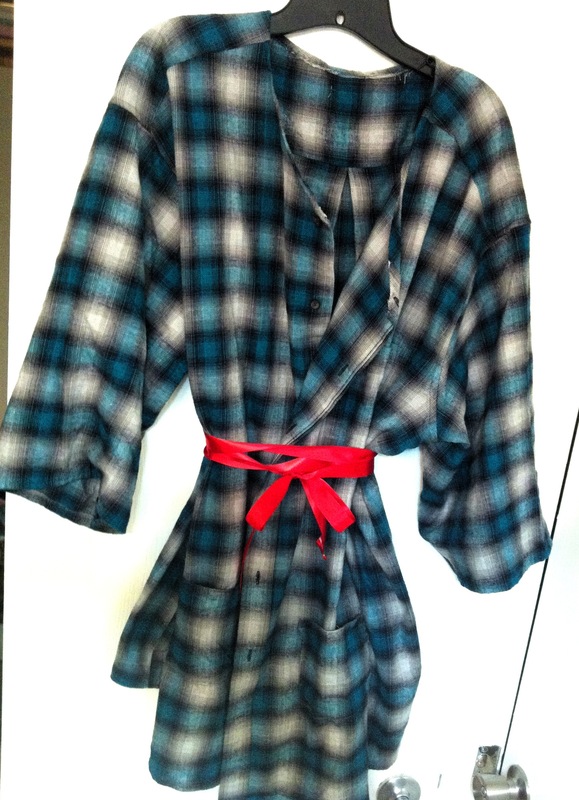 I found a men’s “tall” flannel shirt, and I hacked it to create my perfect robe. I was hoping for a pretty pink flannel (yeah, I know) but no such luck. Instead I found a nice, soft, gray and turquoise super-long shirt on sale for $15. 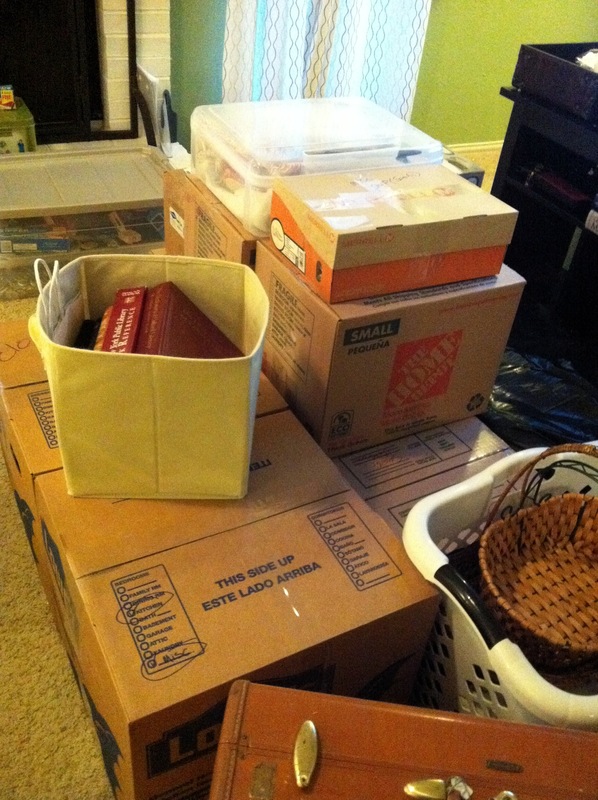 I don’t have step by step photos – as we’re packing up the house I don’t have a good spot to take photos. Instead I’ve done a very bad illustration that I hope helps explain what I did. It is a pretty simple alteration but if you have any questions let me know and I’ll be happy to answer as best I can! First, I cut off the bottom half of the sleeves. I double-hemmed the sleeves, and this left me with what will be 3/4 length sleeves on me. Next, I cut off the collar, and cut a bit of a “V” in the front of the shirt. I hemmed the raw edge, but didn’t bother with a double hem here. Using part of the sleeves I cut off I made two pockets, one for each side. 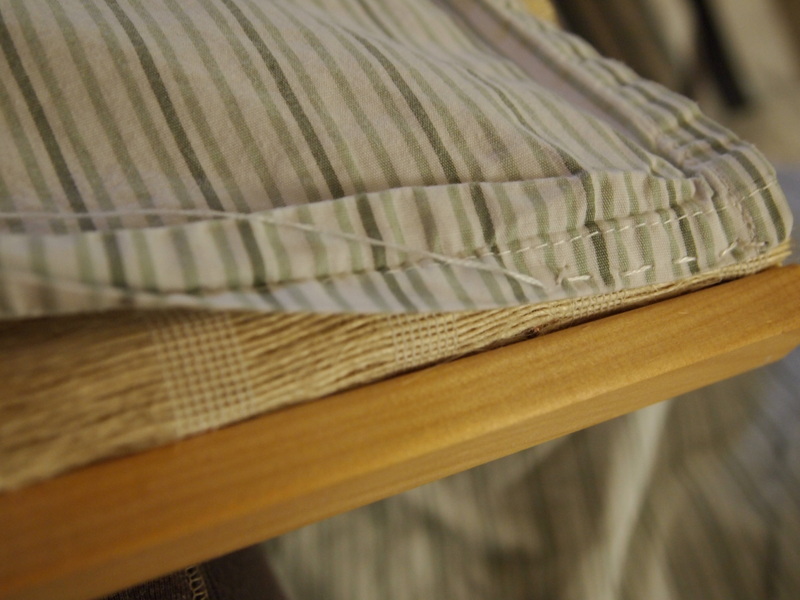 I hemmed the top edge and then folded under and stitched each pocket to the lower part of each side of the shirt. 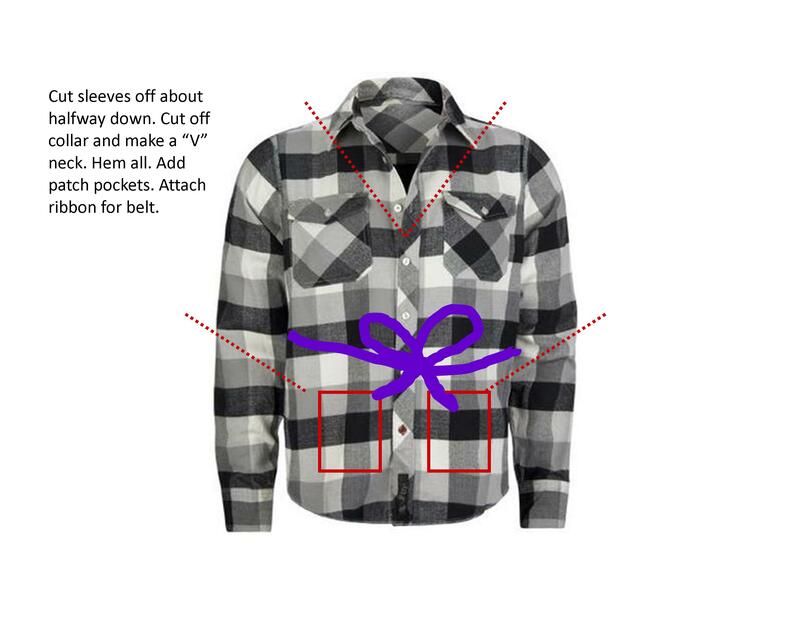 Finally I attached the center of a ribbon belt to the center back of the shirt. I used the back pleat as a guide and eyeballed this. I didn’t break out my iron or sewing machine for any of this – it is all hand sewn and roughly folded over. It’s not as neat as machine sewn would have been, but it’s perfectly fine for me! The only thing I still plan to add is belt loops on the side, so the belt doesn’t just flop down the back when it’s off or untied. It took a little longer than an hour to do, and probably would have been faster if I hadn’t been catching up on episodes of Misfits! The end result is just what I wanted, and has been working out perfectly! Merry Christmas everyone. Just wanted to share an old holiday tradition that you can steal, if you have a santa suit lying around. 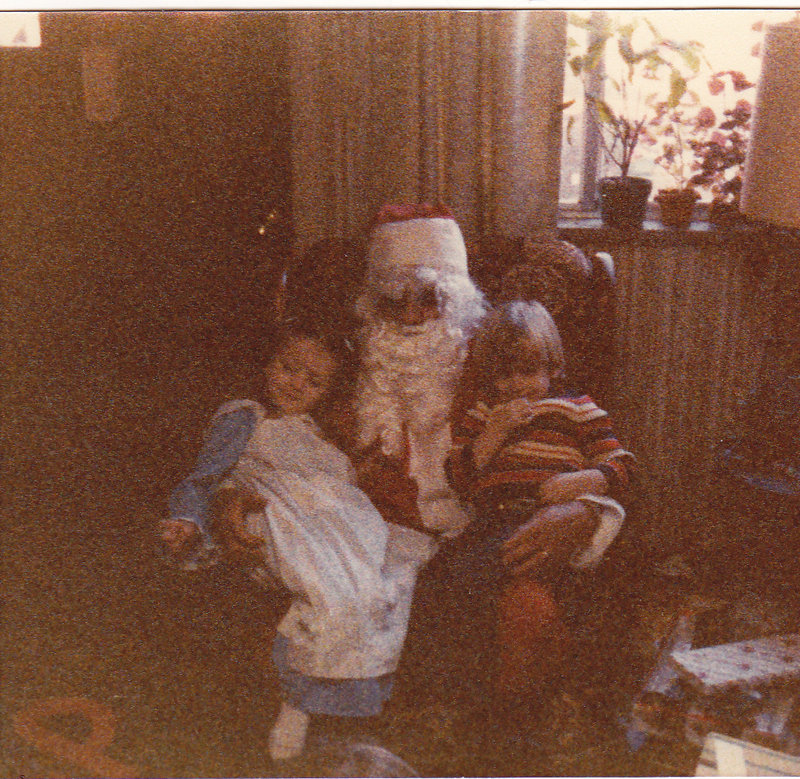 When I was very little, every year on Christmas day, Santa would knock on my grandparent’s front door, come in and give presents, and stay for photos. As I got older I realized this happened about 15 minutes after Grandpa got grumpy and went to take a nap in the other room. Although we all eventually figured it out Santa kept coming until we were almost all teenagers. I imagine these days he’s sitting up in heaven, dressed in a Santa suit, with Grandma on his lap, and a long line of kids waiting their turn. Comments Off on Santa, is that you? December 24th has always been an important day in my family. Of course there is the anticipation of Christmas, and all of the last minute preparations for the holiday extravaganza. Usually there is some sort of celebration already starting, like visiting friends and family, maybe even opening presents. This photo is of my brother, sister and I all dressed up at Grandma Katy’s house, ready to go to Aunt Mary’s. And importantly – it’s my baby brother’s birthday. It’s always felt like a bit of a super-holiday – overfull and overexciting – almost too much, but not quite. Growing up Christmas Eve meant some sort of gathering with Dad’s side of the family. There were snacks and sweets, Christmas music, and family. When I was younger this was always at Aunt Mary’s house, and included my grandmother’s siblings, their kids, and their kids kids. Aunt Mary had a little buffet set up in the kitchen, with ham, cocktail bread, cheese balls (I loved the port wine one), and sweets. There were bowls of “chicken feed” (aka Chex mix) around the house. I got in trouble more than once for picking out the cashews! Uncle Jimmy played bartender in the laundry room – always laughing and telling jokes. We always had to dress up, and be on our best behavior,and remember not to bother Aunt Mary’s schnauzer – he did not like children! 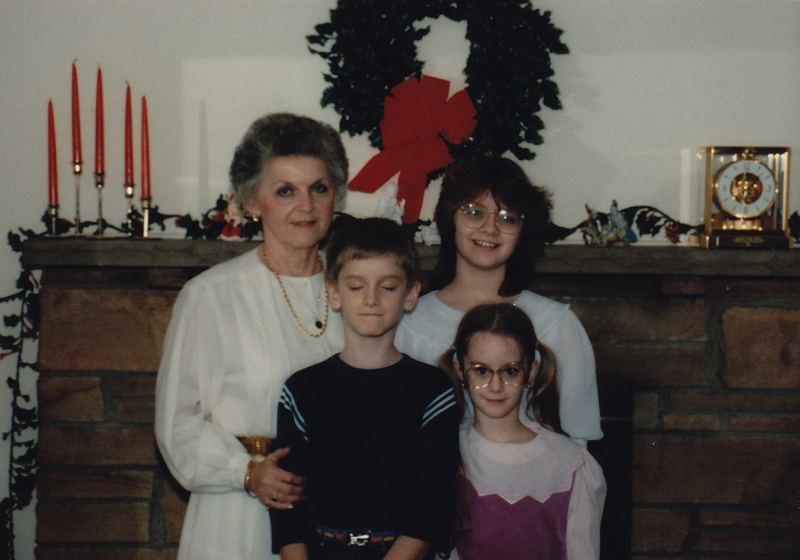 As the years went by the big family gathering became a smaller one, at Grandma Katy’s house. There were still cheese balls, chicken feed, cookies, fudge and family. 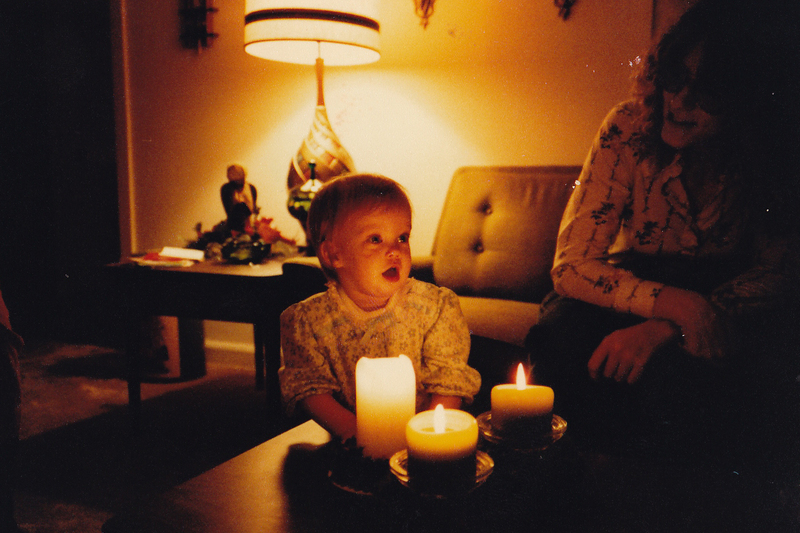 Grandma always had a fire going too, and I loved sitting on the hearth, just as close as I could get without blistering, to listen to the pops and watch the sparks flying up the chimney. We always got to pick one present to open, and I was always terrified I’d open a package of new underwear in front of everyone. I don’t think that ever happened, but it always worried me. The photo at the top is of my brother, sister and I all dressed up at Grandma Katy’s house, ready to go to Aunt Mary’s. The one right above is of my baby sister and my mom a few year’s earlier. As my brother’s birthday just happens to be December 24th, we celebrated that too, each year. He complained quite a bit, but I never really thought about how annoying that must have been. The rest of us were excited about Christmas, and I know he got a lot of presents that were “for your birthday AND for Christmas.” More than once his birthday cake was a holiday cake from the grocery store and his birthday presents wrapped in Christmas paper. 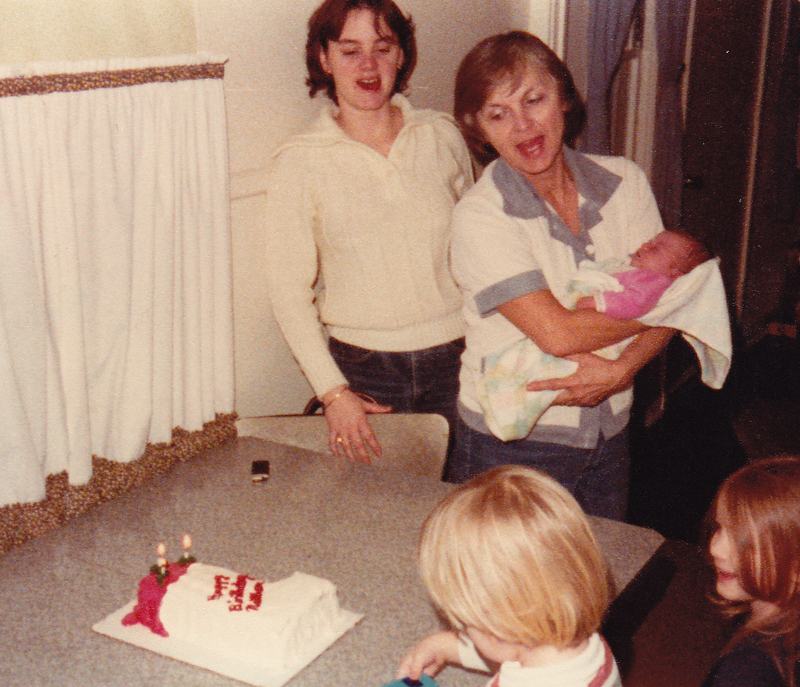 My grandmother, holding my one-week old sister, and my Aunt Beth are singing happy birthday over a Christmas stocking cake in this photo. He and my sister, who’s birthday is just a week before his, always called Christmas “Screwed Out of a Present Day.” Nowadays we try very hard to differentiate birthday cakes, gift wrap and celebrations, but there will always be a bit of blurring on what we’re celebrating. Now that I’m all grown up I’m faced with finding new Christmas Eve customs. I’m married, so there’s my husband’s family to incorporate, and finding a balance between the two families is a work in progress. We don’t yet have true traditions, but we’re working on it. In some ways it’s stressful. I miss the comfort of tradition – of knowing what will happen, where we’ll be when, who we’ll be with. In other ways its exciting! I get to choose what traditions I want. (OK, we want – gotta include the hubby in there.) I look forward to piecing together a comforting quilt of holiday traditions to snuggle under with the folks I love. I wish you all a happy, comfortable holiday, with all the love you can stand. 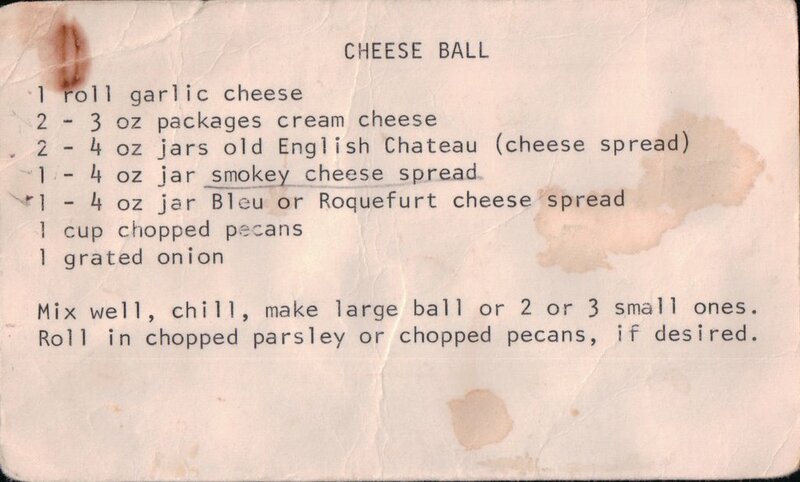 And if you need to add a cheeseball to your traditions, Grandma Katy’s recipe is below. (I don’t think they make English Chateau cheese spread any more, but I think it was a cheddar-y kind of spread. Heck, I’m not sure what you can find in the way of cheese spreads, but here it is anyway.) Happy December 24th! 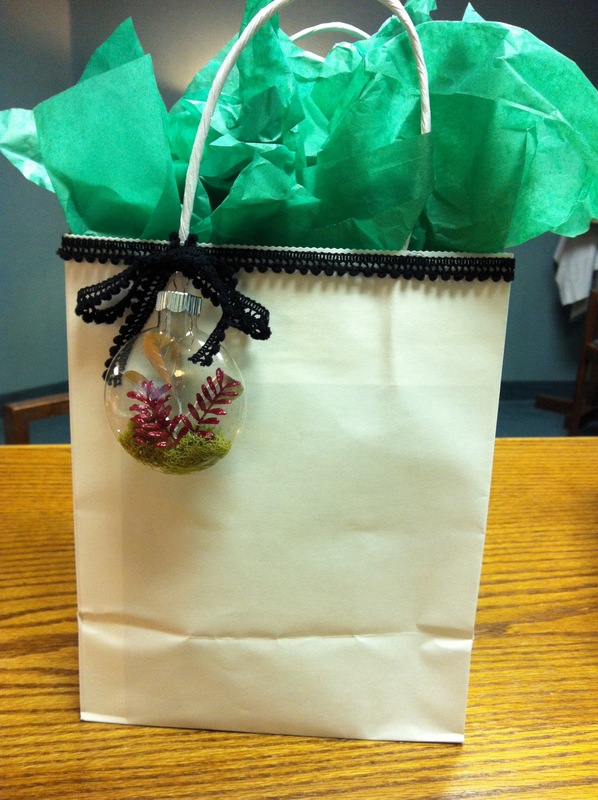 I made these ornaments last year to go with my “woodland” themed goodie baskets (I love a theme!). These were a pretty last-minute project. I think I made them a few days before Christmas, so some of the materials were on sale ridiculously cheap. I got the flatter round ornaments, mostly because I felt the glass was a little thicker than the globe version, but I think they were perfect for these. I bought one package of mixed mosses and an assortment of wild-looking holiday picks (these were 80% off I think – most were under $.20 each!). I used Aleene’s Quick Dry Tacky Glue and a skewer to glue the different elements in. Before starting, cut up your floral picks into smaller pieces that will fit easily inside your ornament. 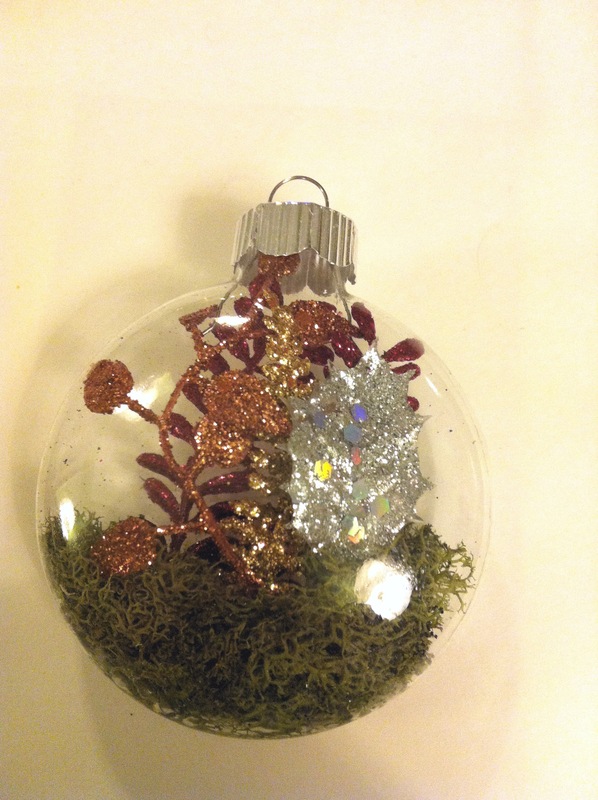 Start with the moss – apply a decent amount pf glue to the bottom inside of the ornament, being careful not to get it all over the sides of the ornament. 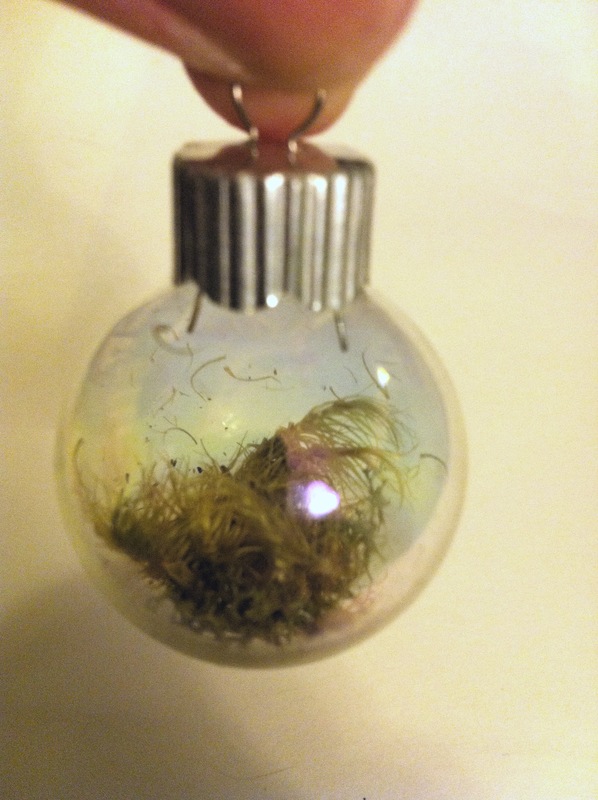 Next, roll up a small piece of moss, enough to cover the bottom, and stuff it into the hole in the top of the ornament. I used a clean skewer and a pair of hemostats (scissor looking things with flat, ridged tips that grip together) to guide the moss into place. Once it was where I wanted it I used the blunt end of the skewer to tamp it down into the glue so it would set. Next I chose the leaves and fronds I wanted to make up my mini landscape. Most ornaments had three pieces (odd numbers look best, right?). Again I applied a gob of glue first with a skewer, then I used the hemostats to shove the floral bits into the ornament, and get that bottom end right into the glue. These dried overnight, then the cap went back on, and a bit of ribbon was attached to the top for hanging. 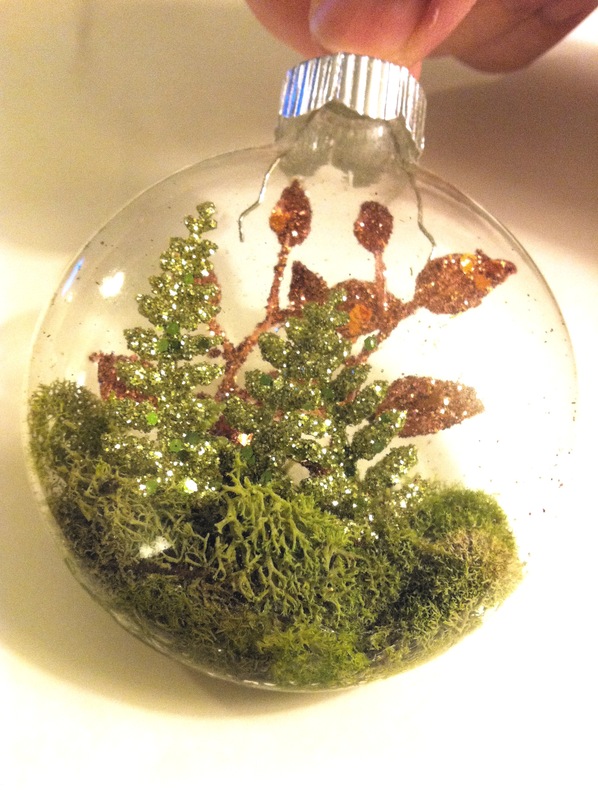 I also did a few tiny ornaments with just some moss inside. They were all a huge hit, if I do say so myself! My sister has hers on her “Alice in Wonderland” themed Christmas tree this year! You can see more photos of her tree on her website, lucidbee.com. 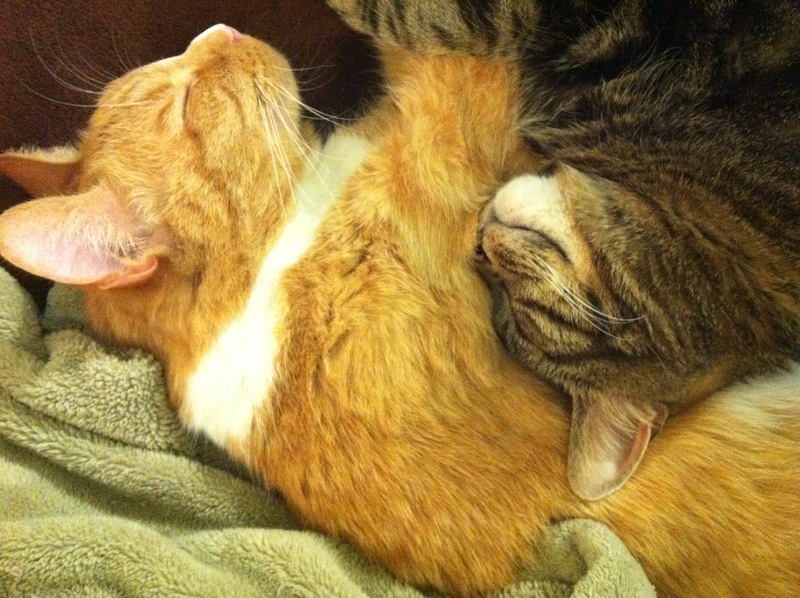 My name is Sarah and I live in Austin with the best husband ever, and two sweet but not-so-bright cats. Although I was born and raised in West Virginia, I call Texas home now. Home and Dry is about all of the things that make up home, and make it the place you want to be.